This is the first game in the Spy vs. Spy series. For other games in the series see the Spy vs. Spy category. 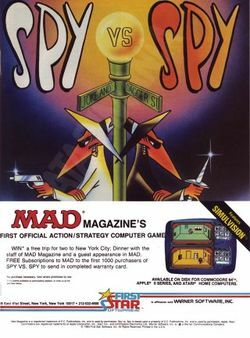 Spy vs. Spy is a computer game developed by Michael J. Riedel, and first published by First Star Software in 1984 for the Atari 8-bit family, Commodore 64 and Apple II computers. First Star was also known for its Boulder Dash series. It was an innovative two-player, split-screen game, based on MAD Magazine's long running cartoon strip, Spy vs. Spy, about the slapstick antics of two spies trying to kill each other with improbably complex and elaborate traps and weapons. The object of the exercise is to kill your opponent as many times as possible, while collecting all the items needed to exit the game before the timer expires. Each spy has a personal countdown timer. When a spy is killed they drop all their items, and are forced to sit out of the game for a few moments while their timer is depleted at a faster rate. It enjoyed very favorable reviews, in addition to winning a variety of awards for its innovation and quality. It was later ported to a much wider range of platforms. It was released on several popular European computer formats, such as the Sinclair ZX Spectrum, BBC Micro, and Amstrad CPC. It received 16-bit conversions on the Atari ST, and Commodore Amiga. It was converted for the home console market to the Sega Master System and NES. An upgraded Game Boy Color conversion was released after a regular Game Boy game, which was actually based on a sequel. The NES version will be re-released on the Wii's Virtual Console in Europe in the near future. Two sequels followed. This game, based on MAD magazine's agents in Black & White, is a madcap game in split screen Simulvision which allows each Spy to see what the other spy is doing. This also allows both players (or one against a computer opponent) to play simultaneously. You travel through a selectable, yet randomly generated maze of interconnecting rooms. While setting and defusing booby-traps, engaging in hand-to-hand combat, searching for the Top Secret briefcase (guess it isn't secret anymore) and looking for the only way out, you must collect your passport, secret plans, money and the key in order to escape from the foreign embassy before your plane takes off without you. This page was last edited on 9 January 2012, at 10:37. This page has been accessed 18,697 times.